Hear we go. Another year. Power Spread just continues to evolve. All 4 of these teams are full blast PS Offenses and 2 of the 4 full blast PS Defense. Those two? Alabama and Clemson. The 2 best teams in the country all year. I’ve already took a look at whether Notre Dame should be in the playoff in a previous post. My conclusion was yes at both the beginning and end of the post. But I don’t these are the four best teams at this point in Time. I do feel OSU and GA are the best with Bama and Clemson. But it’s what we have. 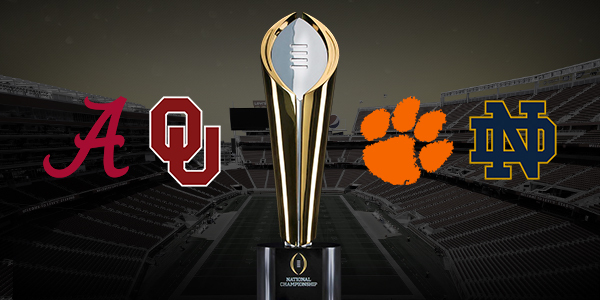 The question is this – Does Notre Dame or Oklahoma have a chance to match up with Clemson and Alabama through an entire game? While most will look at Offense in this age of PS Evolution, I feel it’s the defenses that will determine whether ND and OU have a chance to pull off a big upset. As I said above, the two full PS Defenses are Alabama and Clemson, not the underdogs. What’s more, the #1 and #2 also have more talent. Better scheme with better talent is a hard combo to beat. As I stated in a previous post, the DC for ND Clark Lea has done a great job continuing Mike Elko’s tricky 4-2 Defense. Not only has the transition been seamless, but Lea has shown more aggression with zone blitzing to go with the mix of coverages. ND’s Defense is really the one chance they have to win this game. They are good enough to hold Clemson down early and provide their Offense a chance to get rolling and possibly pull out a great last minute win. The big question is this — WILL ND’s OFFENSE ACTUALLY GET GOING AT ALL VERSUS BRENT VENABLES DEFENSE?? The only chance is that a couple of top players on that side of the ball are suspended for this game. But Venables has proven in the past he can win with a wide variety of talent. His schemes combined with his play calls are second to none right now. For me this is the reason I just can’t see ND pulling this off. Venables learned from the best – the Stoops Brothers. Who’s Defenses were cutting edge for a long time. Combine that with what he learned from Vic Koenning who’s mentor was one of the great defensive innovators in the game, Joe Lee Dunn. Venables still runs a base 4-3 Hybrid like Bob Stoops ran at OU, but his mix both with the blitz and coverage is incredible. See this play by play analysis of Venables schemes and calls during the 2016 Auburn game. This is a crucial time when Venables was cementing his philosophy and schematic concepts at Clemson. Lea mixes a lot, but nothing like Venables. The analysis I did was from 2 years ago, but it’s the beginning of Venables at his best – an incredible mix of pressures and coverage looks! EVERY SINGLE PLAY. Amazing. Even a little talent is enough in this scheme. And Venables has more than a little talent. Saban is the head of his Defenses and while he used to be a cutting edge innovator – recent PS innovations of late have come from his assistants – especially Jeremy Pruitt who left for a head job. The new DC is a young guy Tosh Lupoi who has been with Bama since 2014. Before that he learned the Nick Aliotti Agg Mix under Bob Gregory and Justin Wilcox. Combined with Kirby Smart and Pruitt, Lupoi has to know what he’s doing. Of course, the enormous talent on Bama helps as well. Interestingly, Pruitt learned some of his trade via Mark Stoops while at FSU. He replaced Stoops as DC, but mixed in some of Stoops 3-3/3-4 Hybrid schemes with what he learned under his wise mentor Bill Oliver and Saban/Smart. All at Alabama. Top Notch stuff. There was a time where all the Stoops Brothers were on the cutting edge shifting zone/man coverages behind the Zone Blitz. This is what Venables came from and uses to a high degree now. Unfortunately for OU, this is no longer the case with former DC Mike Stoops being replaced partway through the year by Ruffin McNeil. Mike really regressed schematically over the last couple of years. McNeil represents nothing more than a further regression. In recent years, instead of evolving towards more Aggressive Variety from a 4-3/3-3 hybrid, Mike Stoops went more towards a 4-2 Quarters and mixes off of that. In layman’s terms – he has gotten LESS AGGRESSIVE with LESS VARIETY and his Defenses have paid for it. Many OSU fans came down on Schiano’ Defense this year, but he’s actually very aggressive. Just needed more variety and is working on it. Stoops isn’t even that evolved. He went the wrong direction with his ideas – similar to Brian Kelly and his offense – thus creating a very tough situation for the Sooners before they finally fired him in October with McNeil as a bad stopgap solution. While I think OU can score plenty of points to keep up with Bama, they will need to come up with big plays on D. Hopefully McNeil mixes enough to get a couple of big turnovers but don’t hold your breath. Without the Sooners making big plays on D, Bama will not only rack up yards and points, they will put pressure on OU’s Offense to score and most likely get big plays with their own stout Defense. At that point OU’s only hope is that Saban gets conservative with a big lead and OU runs a Frantic Uptempo Offense in the 2nd Half and get on a crazy roll for a crazy comeback victory. Obviously the heavy probability as it’s been all year is Alabama vs Clemson for the National Title. In my opinion the team with the best chance to knock either of these teams off is getting ready for the Rose Bowl. I believe both of these games could be a blowout, though I think it’s much more likely with Clemson than Bama because of Brent Venables. I don’t see ND keeping up with the scoring versus Venables Defense. I do think Lincoln Riley’s top notch PS Offense can keep up with Bama’s top notch PS Offense IF the Defense can make some big plays OR Saban gets conservative with an early lead. If it gets tight and Saban blows a fuse (which he’s been known to do) then anything could happen. So in the end I see a slightly higher probability of a Clemson, but a high probability of a comfortable Bama win due to OU’s very porous DScheme versus the high powered PS Offense of Bama. *Percentages are taken with differing variables. Not all the #s are from the same specific analysis.